At Techno we believe sharing our knowledge of CNC technology has helped many teachers and students create fun, easy projects in the classroom. Better yet, some of our best educational projects have come from you the teachers! Have you created a quick-and-easy project for your school's technology program that you would like to share with others? Complete the following form and we will place it online, Free of charge, for other teacher's and students to download:: CNC Projects! Compiled from a few sections of the "Basic Manufacturing Skills: Introduction to CNC Machining" this project will provide some basic concepts to get your students started. We advise that you purchase the complete curriculum, part number: H22T12-HTO0521,for our Intro to CNC Machining projects, brief history in manufacturing, instructor resources and more. *Please note this project requires that you have purchased Mastercam Software prior to downloading this project. This download does not include the software! This tutorial will go through all the steps showing students how-to make inlays. The tutorial provides a detailed step-by-step set of instructions for sample geometry - including how-to draw the design, generate the toolpath in Mastercam, and how-to appropriately fixture/route the part on Techno CNC servo machines. The tutorials available are for Mastercam versions X2 and X4, for those who need X3, the Mastercam X2 instructions are sufficient for use. (2) 1/8" Upcut & (2) 1/8" Downcut. Download the file Inlay_Project_MasterCAMVX2-X4.zip. This zipped download contains the instructional document as referred above. 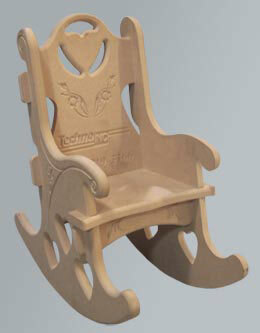 Create, route and assemble a rocking chair (approx. 2'x1') in minutes using a Techno Router and the downloadable Mastercam files below. Simply secure a flat piece of MDF on a Techno Router, then run the toolpath files and the Router cuts out the parts, the decorative carvings and lettering in just a few minutes. The Rocking Chair assembles without any screws, nails or adhesive. The best part of this project is that once you learn this basic cut to fit CNC manufacturing technique, you can expand on that knowledge to create other projects and assemblies! Download the file Chair.Zip. This zipped download contains numerous files, including: setup and material instructions, various G-code (.nc) and Mastercam files, warning and notes. Similar to the popular Rocking Chair, the NEW Techno Wagon downloadable project expands your skills on a Techno Router, and Mastercam Software. Just download the .zip files, place a 3/4'' sheet of MDF on a Techno Router, run the toolpath files, then assemble with 4 Screws and Lock Nuts. 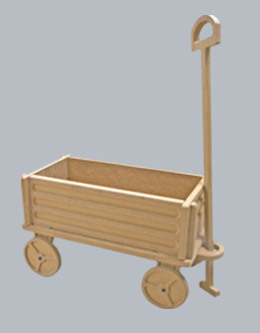 In minutes the Router cuts the parts and carves the wagon design easily. The finished project can be painted or stained giving you a great home decoration or gift idea while expanding your CNC manufacturing technique. including: setup and material instructions, various G-code (.nc) and Mastercam files, warning and notes. All you need to complete this project is a Techno CNC Router, MasterCam X and Techno’s very own CO2 Curriculum, then download this instructional document and begin creating your CO2 Cars easily. This project is great for both novice and beginners and can be used to create similar CO2 Cars that won National Championships. Download the file MasterCam.zip. This zipped download contains the instructional document as referred above. *Please note this project requires that you have purchased the CO2 Fixture and Curriculum for a previous version of MasterCAM prior to downloading this project. This download does not include the software. This instructional document provides you with the information you need to design Techno’s classic CO2 Car in Solidworks, then create the toolpath in MasterCam X4. 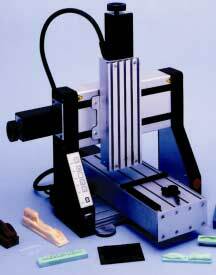 All you need to complete this project is a Techno CNC Router, T-Flex, MasterCam X and Techno’s CO2 Curriculum. You can reference the Designing a CO2 Car Using Mastercam X above for additional technical information on this project. Download the file CO2-SOLID.zip. This zipped download contains the instructional document as referred above.